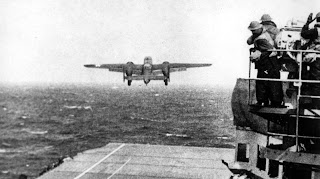 cryptonaut-in-exile: The surviving members of the Doolittle Raiders held their last reunion. The surviving members of the Doolittle Raiders held their last reunion. "I bailed out," Griffin says. "I bailed out at night, in a storm, from 10,000 feet. And I could just see my [parachute] — it would open up right over my head, and it would go over here, and it would start to collapse, then it would come back up over my head again ... I was in a big pendulum." There's another story about this, heard this morning on the way to work (link above is from last year at this time), which I'll add when available. Only three were healthy enough to attend the meeting this year (four still survive), so they've announced it will be the last reunion.